My dearest readers, I took your advice and decided to just stop stressing and go on our weekend getaway. We had a great time, and I thank all of you for encouraging to unwind and calm down! On the way to Lubbock Friday night, Dan and I were amazed at the amount of highway patrol out pulling people over and the amount of traffic on the highway. I initially thought law enforcement was heavily patrolling because of Halloween parties, pranks, etc. Then I started noticing a trend - a lot of the cars pulled over, and those passing us, seemed to be decorated in burnt orange. Yes, I obviously live under a rock because we were 2 hours into a 4 hour road trip before I realized UT was playing Tech. I'm brilliant, I know. Anyway, we saw lots of over zealous football fans driving way too fast on the way. At this point I must say I do not advise going to Lubbock the weekend the Raiders play the Horns. It's crowded and crazy. When I suggested we drive by the stadium during the game so I could get pics for my blog, I was answered with "are you nuts?' stares. The only time worse than this that I've personally witnessed is when the Aggies come to town. It's full on football craziness! WE watched the game on TV and all I can say is WOW! It was a great game! I love me some football! Anyway, I have no great game pics to share, I'm sorry. I did get some the next day of the mega mess the tailgaters left and the poor folks on clean up duty. 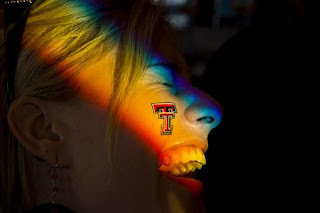 I also got some of Lubbock all spirited up for the red and black. I'll try to post those tomorrow. We had a great time visiting the family. I got to spend some time with my niece and nephews, which I really enjoyed. I hate that we don't see them more often. They are all much younger than our kiddos and seem to change so much between visits. Miss Brooke had grown so much and looked so different! I love that cute little red head! Ethan is growing like a weed, is super smart, and seriously has the most awesome laugh I've ever heard. And Milo is walking! I knew this of course, but it was great to get to see him do it. He had changed the most out of the bunch - little ones grow so fast. He is just adorable, laid back, and I learned at breakfast the kid likes scrambled eggs, a lot! He ate about half of his Papa's breakfast! Anyway, I got to spend a good chunk of Saturday with Milo and Brooke and I savored every minute of it! I wish I'd seen more of Ethan, but he went with the guys. I love and miss those three so very much! I also got to spend some girl time with two amazing women, Tammy my sister in law, and Sheralyn, my mom in law. Tammy and I took the two littlest ones to Target shopping and had a blast! Target clearance rocks! We both found some stocking stuffers and she found an adorable little purse for cheap! We had so much fun! We hardly ever get any girl time. Then I got to spend a lot of time with Mom,. We shopped, ate, laughed, talked, played cards, and generally just enjoyed each other. At breakfast Sunday the waitress said she saw our "mom hug" we shared in the parking lot and it made her think of her own mom in Arizona. She was kinda teary eyed about it, and it made me the same. Mom and I have not had the easiest of relationships, but now I love her so dearly. The fact that someone saw us together and read us as being actually mom and daughter was quite special and touching. Unfortunately we didn't see much of Chris and Abby. Chris is busy working on his masters degree. Abby just seems to be a super busy gal. We love them and wish we could see them more often, but life happens. Maybe things will settle down when Chris graduates. Until then we just have to be content with very short visits. The kids got their Christmas gifts from Nanny and Papa early. We have two new family members, David and Cameron, a pair of guinea pigs! The kids are so excited! I just hope they keep caring for the little fur balls after the new wears off. So far they are doing a great job. Time will tell I suppose. Tristen's is actually his birthday/Christmas gift, since his was bought first and had to get all the cage, supplies, etc. The literature we were given said the do great in pairs, so Ash got hers the next day. We couldn't say yes to one and no to the other, right? I think it's going to work out okay. Ashley also had fun spending the birthday money Uncle Jason & Aunt Tammy gave her. She spent half at the Cracker Barrel store. Don't you just love that place? Note to anyone who cares, I could use some birthday money to spend there, lol. Anyway, she was thrilled because she bought two things for herself, something for her brother, and still has half her money left! This kid can really stretch her pennies. I'm so proud! Anyway, thanks again to all who encouraged me to go! I had a wonderful time and came back recharged. All that and you came home and did a wonderful cleaning job on the front two rooms of your house! Your great. See the weekend away revitilized you. It sounds like just what you needed. We watched the UT Tech game at friends of ours who are Tech alumni...It was fun to see how excited they were. I also am a Cracker Barrel Junkie. It has the best stuff! I am so glad you had a refreshing time. I wish I could have seen you more. Maybe next time. P.S. Chris was wondering if you would notice if we sent you Bailey and kept your dog! She's a super sweetie.